Europasaurus is a basal macronarian sauropod, a form of quadrupedal herbivorous dinosaur. 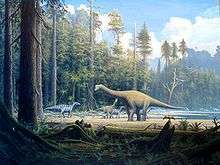 It lived during the Late Jurassic (middle Kimmeridgian, about 154 million years ago) of northern Germany, and has been identified as an example of insular dwarfism resulting from the isolation of a sauropod population on an island within the Lower Saxony basin. Europasaurus holgeri exhibits the following unambiguous autapomorphic states: "nasal process of premaxillary projecting anterodorsally; medial notch is posterior dorsal margin of cervical vertebral centra; scapular acromion with a prominent posterior projection; and transverse width of astragalus twice its dorsoventral height and anteroposterior width." In comparing Europasaurus with Camarasaurus, Europasaurus differs "in the wing-shaped posterior process of the postorbital being slightly longer and wider than the anterior process, whereas it is much shorter in Camarasaurus." Other differences include Europasaurus' shorter nasal-frontal contact and a parietal bone which is rectangular in posterior view. Unlike Camarasaurus, the neural spines of the presacral vertebrae are undivided. In comparing Europasaurus with Brachiosaurus, the former genus differs from the latter by having a shorter muzzle, a quadratojugal which makes contact with the squamosal, and an anteromedially flattened humerus possessing unaligned proximal and distal epiphyses. Europasaurus was also compared with the macronarians Lusotitan and Duriatitan and found to be distinct from both those forms. Finally, Europasaurus can be distinguished from most known members of the Neosauropoda by its very small adult body size. Remains of both adults and juveniles have been recovered from marine carbonate beds ("bed 93"), representing more than eleven individuals ranging from 1.7 to 6.2 meters in total body length. The genus name means "reptile from Europe" (Europe + Greek sauros = lizard, saurian), and the species is named in honor of Holger Lüdtke, who discovered the first fossils of the taxa. The holotype specimen (DFMMh/FV 291; Dinosaurier-Freilichtmuseum Münchehagen/Verein zur Förderung der Niedersächsischen Paläontologie) consists of portions of a disarticulated skull, along with cervical and sacral vertebrae, derived from a single individual. This specimen and all others referred to the taxon were collected from "bed 93" at the Langenberg quarry, Oker near Goslar, Lower Saxony. The species was named by Octávio Mateus, Thomas Laven, and Nils Knötschke in 2006. A cladistic analysis of Europasaurus holgeri  indicates that the species' dwarfism is a derived characteristic, and that this taxon is a more derived macronarian than Camarasaurus, and should be regarded as the sister group of the Brachiosauridae and all more derived members of the Titanosauriformes. Restoration of the habitat of Europasaurus. It has been suggested that the ancestor of Europasaurus would have "dwarfed rapidly" after immigrating to a paleo-island, as even the largest of these islands in the Lower Saxony basin (a landmass of less than 2,000 square kilometers) would not have possessed sufficient food for a population of large sauropods. 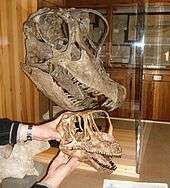 Other examples of insular dwarfism among dinosaurs have been cited from the Maastrichtian (latest Cretaceous) Haţeg Island in Romania, namely the sauropod Magyarosaurus and the hadrosaur Telmatosaurus. In these two examples, paleogeography and paleoecology have been employed to explain the evolution of new and miniature versions of larger species. These fossils were determined to represent a dwarf species, and not merely juveniles of a large macronarian species, by studying the histology of the fossil bones. Likewise, by comparing the long-bone histology of a typical large-bodied sauropod, Camarasaurus, paleontologists have concluded that the diminutive size of Europasaurus resulted from a decreased growth rate. This phenomenon is a reversal of the accelerated growth responsible for gigantism in other sauropod dinosaurs. Dwarfism among macronarians seems especially remarkable as this clade includes some of the largest known dinosaurs, such as the brachiosaurs Brachiosaurus and Sauroposeidon. The evolution of smaller body size in Europasaurus is thought to have involved pedomorphism. 1 2 3 4 5 6 7 8 Sander, P. M.; Mateus, O. V.; Laven, T.; Knötschke, N. (2006-06-08). "Bone histology indicates insular dwarfism in a new Late Jurassic sauropod dinosaur". Nature. 441 (7094): 739–741. doi:10.1038/nature04633. PMID 16760975. ↑ Stephen L. Brusatte (30 April 2012). Dinosaur Paleobiology. John Wiley & Sons. p. 210. ISBN 978-0-470-65658-7. ↑ Brian K. Hall; Benedikt Hallgrímsson (1 June 2011). Strickberger's Evolution. Jones & Bartlett Publishers. p. 446. ISBN 978-1-4496-4722-3. ↑ D'Emic, M. D. (2012). "The early evolution of titanosauriform sauropod dinosaurs". Zoological Journal of the Linnean Society. 166 (3): 624–671. doi:10.1111/j.1096-3642.2012.00853.x. ↑ Nopsca, F. 1914. Über das Vorkommen der Dinosaurier in Siebenbürgen. Ver. Zool. Bot. Ges. Wien. 54: 12-14. ↑ Weishampel, D., Norman, D. B. et Grigorescu, D. 1993. Telmatosaurus transsylvanicus from the Late Cretaceous of Romania: the most basal hadrosaurid dinosaur. Palaeontology 36: 361-385. ↑ Marpmann, J. S.; Carballido, J. L.; Sander, P. M.; Knötschke, N. (2014-03-27). "Cranial anatomy of the Late Jurassic dwarf sauropod Europasaurus holgeri (Dinosauria, Camarasauromorpha): Ontogenetic changes and size dimorphism". Journal of Systematic Palaeontology: 1–43. doi:10.1080/14772019.2013.875074.